Join the American Planning Association, the Association of Pedestrian and Bicycle Professionals, and the City of Azusa for an amazing walking tour and networking opportunity in Downtown Azusa and Congregation Alehouse! Participants will meet on Azusa Avenue, immediately north of the train station @ 10:00 AM (across the street from the Target entrance). Public Art in Azusa. From our starting point we will enjoy a new mural and learn some of its background; the mural is located on the recently built (AND VERY POPULAR) parking structure that is shared by the City of Azusa, Foothill Transit, and Metro. Santa Fe Depot. South of the train tracks are an old Santa Fe Line depot and Alameda Avenue. Several options are being considered by the City, such as restoring the depot and a temporary close of Alameda Avenue for local events; come here what options are being considered for improving pedestrian access near the Gold Line Station. Azusa Avenue Streetscape. Azusa Avenue, downtown Azusa’s main street, is lined with active ground floors of local businesses and provides a very comfortable pedestrian environment with landscaping and trees, pedestrian crossings, and lighting. Hear about how the City developed this streetscape and what strategies are being used to extend this environment throughout downtown Azusa. Block 36. Within the downtown Azusa area there are several City-owned opportunity sites, such as Block 36. The City of Azusa is engaged in a procurement process for this site. Attendees will have an opportunity to hear City staff discuss proposals and the Citys vision for this site and downtown Azusa. Our journey will conclude at Congregation Alehouse. We have an area reserved in the patio and the business operator will chat with us regarding this establishments location and decision to be located in a downtown area near transit. American Pedestrian and Bicycle Professionals (APBP) is to grow the pedestrian and bicycle profession and its influence by facilitating the exchange of professional and technical knowledge, elevating practitioners skills and defining the field. From a handful of members in 1995, the organization has grown to include 1,300 members in the United States and Canada. APBP members work at all levels of government, in manufacturing, and as consultants, advocates, researchers, and students in a wide range of disciplines: transportation planning and engineering, urban design, landscape architecture, public health, active living, and Safe Routes to School. APBP offers technical training and resources to build capacity for sustainable transportation, including a monthly webinar series, the biennial Professional Development Seminar, Complete Streets and pedestrian accessibility workshops, and the respected Bicycle Parking Guidelines, 2nd Edition. Kurt Christiansen, AICP – Kurt Christiansen is the economic and community development director for the City of Azusa, California. Previously, he served as community development director for Yorba Linda and development services director for Sierra Madre. Christiansen has served as president of APA’s California Chapter, vice chair of the Chapter Presidents Council, and a member of the APA Governance Committee and the Membership Committee. In 2015 Kurt oversaw the development, completion, and adoption of the Azusa TOD Specific Plan, which focused on land use, design, and circulation in the downtown Azusa area in anticipation of the Gold Line Foothill extension that opened in March 2016. He is a member of the California State University, Northridge, Urban Planning and Studies Department Alumni Council. He earned his bachelor’s degree from California State University, Northridge, and master’s degree from the University of California, Los Angeles. 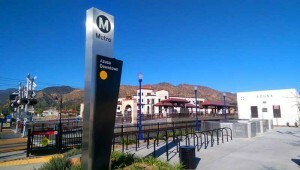 Parking/Transit Information: Parking is available at the Downtown Azusa Gold Line Station. Take the Metro!